Social media sites are all about content in a variety of forms. From written content to photos and graphics, there are many ways for users to participate, engage, and show off their creativity. 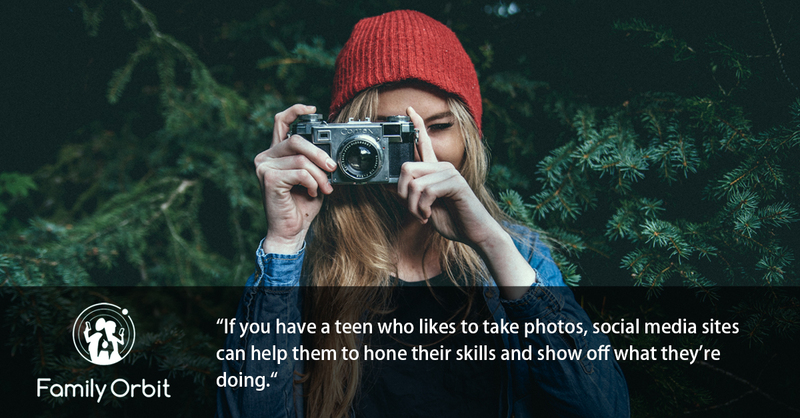 If you have a teen who likes to take photos, these sites and apps can help them to hone their skills and show off what they’re doing. For young people who like to write or create graphics and digital designs, social media is an ideal place to share their work and get encouragement and feedback from others. Teens can come up with fresh, innovative ideas, and get instant feedback. In this way, social media can be a tool for creative teens. Parents often worry about the safety of their children when they use social media – and that’s if they’re not completely oblivious to the potential dangers. However, teenagers can learn to keep themselves safe online, and their savvy security and safety skills can extend into their offline life too. A study by the Pew Research Center revealed that 60% of Facebook users aged 12-17 set their profiles to private. While that means that many still need to tighten up their security, it shows that the majority of teenagers are aware of the benefits of online security. Social media can be an excellent resource for educating teenagers. Talking to teens one-on-one might provide more opportunities to control the narrative, but social media and the internet in general still offer a useful way to educate young people. They can learn new things through articles shared on social media networks, or perhaps by watching videos on YouTube and elsewhere. Many educational organizations, news networks, and other educational bodies use social media to inform and often specifically to reach out to teenagers too. It’s no secret that the internet is home to a lot of disinformation and misinformation. The downside to everyone being able to share their view or opinion is that false information can easily be circulated. However, this can be a good thing for teenagers if they’re taught to assess information and people’s opinions in the right way. With the right critical thinking skills, they can fact check, research and form their own opinions. Everyone has fallen for a lie at some point because they’ve been quick to react, but teenagers can develop the skills they need to stop and think about something before sharing it unquestionably. The social aspect of social media is one of the biggest positives it offers. It gives teenagers the chance to interact with their peers and perhaps to make new friends in a safe way too. Social media can help teenagers who might struggle to communicate offline to develop their social skills in a space where they can have more time to think about their actions and find people who share their interests. Social media often presents opportunities for debate and conversation, allowing teenagers to learn how to discuss a variety of topics. Social media can be perfect for getting creative, learning how to solve problems, and finding innovative approaches to different aspects of life. Even when teenagers are making memes and joking around, they’re using their creative skills. You might think a teenager is messing around and making a silly picture, but what they’re doing could be helping them to learn valuable design skills. They might spend their time taking photos, writing blog posts or sharing videos of their daily life and the things they enjoy. These are all opportunities to develop and express their creativity. Using social media gives teenagers the chance to expand their worldview and get out of the bubble of their own community or circle of friends. It exposes them to different viewpoints, news from around the world and people from around the world too. It can be beneficial for teenagers to start learning about what’s happening outside of their world, understanding big issues and even making new friends from different backgrounds. Social media makes it easier to do this, even if teenagers restrict their contact to friends and family or friends of friends. Many teenagers may feel like they’re not listened to, however true that might actually be. Others feel shy or unsure about speaking up in person. However, social media can give teens a way to express themselves in a different manner. Whether they choose to write, make images or record videos, they can express themselves in a less direct way. People might see what they’re doing, but they don’t have an audience or large group of people watching them in person. Social media can allow them to have a voice and might give them the confidence to speak out more offline too. As a communicative method, using social media can be a great way for teens to support and inspire each other. Many teens use social media, in addition to texting, as their main forms of communication with their friends. They use it to stay in touch, but don’t simply spend all of their time sharing memes. Teenagers also use their social media accounts to support each other and talk about bigger issues in their personal lives. Social media can help to strengthen friendships and keep friends close. Young people are often unfairly characterized as being self-absorbed and selfish. But many of them use social media to do good and make positive changes within their community and others. Social media offers easy ways to show support for (or condemn) an issue, raise money, promote a charity event or spread an important message. Teenagers can be encouraged to get involved in philanthropic and altruistic causes via social media. Teens today are used to engaging with their peers on a daily basis through social media. They likely check their accounts every few hours, if not sooner, to see what they’ve missed and what’s been shared and discussed among their friends. While it’s not a face to face interaction, social sites and apps can help them to improve their social skills, encouraging them to communicate with others that they may not have been likely to talk to otherwise. This can help teenagers to make new connections, meet new friends, and expand their community. Their social circle can grow, and for introverted individuals, these apps can make meeting and connecting with people a much more pleasant experience. A healthy balance of online and in person interactions is good for everyone, teens and adults alike. It isn’t healthy for teens to rely on social media for their self-worth, and that can be a drawback. At the same time, it can be seen as a positive, because social sites can help to boost their self-confidence. If you have a shy, introverted teenager, the interactions that they have on social media could actually help them to feel more confident. They can engage and interact with people from all over, and these sites and apps also introduce them to different ideas and different ways of life. Teens may find like-minded people, and this can help to feel more confident about their areas of interest. It can carry over into their in-person interactions, allowing them to overcome shyness. There might be some issues surrounding social media and teenagers where you have to tread carefully. However, there are many positives that teens can take away from social media too. Social media can and should be fun for young people. It can have very real positive effects on teens, helping them to improve their communication skills, express themselves creatively, and build their confidence. As long as you’re not seeing it have any negative impact on your teen, you should continue to encourage them to use social media responsibly.